MEMPHIS, Tenn. (AP) — Johnny Manziel says he remains confident in his ability to play football “at any level” as the 2012 Heisman Trophy winner attempts another comeback, this time with the Alliance of American Football’s Memphis Express. An introductory news conference was held Tuesday in Memphis for Manziel, who agreed over the weekend to join the new league. The former first-round draft pick out of Texas A&M dealt with a series of off-field issues during his stints in the NFL and CFL. 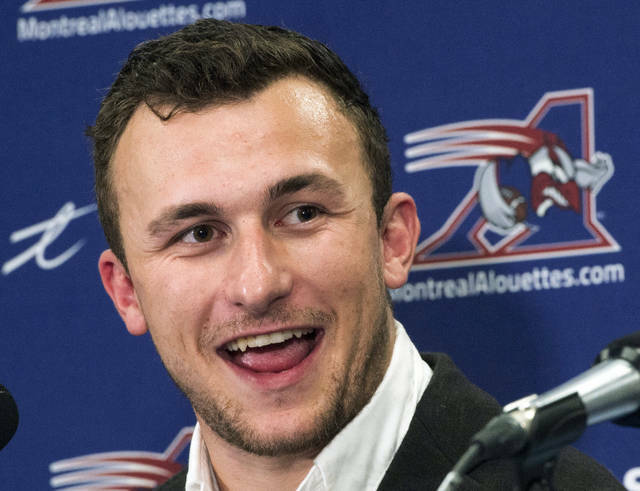 Manziel’s rights in the AAF belonged to the San Antonio Commanders, but they declined to sign him. He was awarded through the league’s waiver system to the Express, who have a league-worst 1-5 record. He joins the spring league for its inaugural season less than a month after the CFL terminated his contract with the Montreal Alouettes. CFL officials also informed the league’s other eight teams that they wouldn’t register a contract for Manziel if any tried to sign him. CFL Commissioner Randy Ambrosie said Manziel “had violated one of the conditions we had set for him to be in our league” without offering specifics. Manziel had sought treatment for anger management and alcohol abuse as part of his acquittal on a 2016 charge of domestic violence. Express coach Mike Singletary was happy to take a chance on the guy who earned the nickname “Johnny Football” while dazzling Southeastern Conference crowds with his combination of passing and running prowess. “Our guys are excited, our team is excited and I feel that many of the people here in Memphis are excited,” Singletary said. Manziel said he is refocusing his life and believes playing football again will help. “I’ve done a lot of soul searching and a lot of looking at myself in the mirror and coming to the realization that when I’m on a football field and on a team, my life is substantially better,” he said. Manziel went 2-6 as a starter with Montreal last season and completed 64.2 percent of his passes for 1,290 yards with five touchdowns and seven interceptions. He also ran for 215 yards on 29 carries. His pro career began with the Cleveland Browns, who selected him with the 22nd overall pick in the 2014 draft. Manziel made two starts in 2014 and six more in 2015 before the Browns released him in March 2016. Manziel completed just 57 percent of his career pass attempts. He threw seven touchdown passes and seven interceptions. His arrival could boost a Memphis team that has dealt with adversity at the quarterback position. Zach Mettenberger replaced Christian Hackenberg as the Express’ starting QB early in the season. Mettenberger injured an ankle Saturday on the first play from scrimmage and was unable to return in the team’s 22-9 loss at Salt Lake. He was replaced by Brandon Silvers. It’s probably fair to compare the opening of the NFL’s business season with the wildness often seen on the stock market floor. A frenzy of bidding and trading and changes of mind — all involving millions of dollars. Antonio Brown didn’t want to be a Steeler anymore. Nor did Le’Veon Bell. Odell Beckham Jr., was unhappy with his quarterback in New Jersey. So Brown, whose antics at the end of the 2018 season pretty much guaranteed he would be leaving Pittsburgh, landed in Oakland, where he presumably is thrilled with a new contract that guarantees him $30 million; he had no guaranteed money remaining on his Steelers deal. How long he will be happy with Derek Carr after becoming dissatisfied with Ben Roethlisberger depends on how often and accurately Carr gets Brown the ball. Bell, who sat out the entire 2018 schedule rather than sign another franchise tag, saved a year of wear and tear, always a consideration for a running back. Then he got a megadeal from the Jets that satisfies his demands for financial security: $52.5 million for four years, with more than half of that pretty much guaranteed. He also has some attainable incentives that could increase the total package. The Beckham trade echoes the Brown situation only in that his shenanigans — and criticisms of Eli Manning — made his team tire of him despite all of his electrifying skills. Where the Giants prospered and the Steelers didn’t was in the value of compensation: Cleveland parted with a first- and third-round draft pick and Jabrill Pepper, who should start at safety. But Beckham also got out of a place that didn’t totally please him. While defensive linemen tend to come into the NFL and make an early impact, it’s far more rare for blockers to do so. Thus, teams are turning more and more to free agency for guys to protect their most valuable commodity, the quarterback, and open holes for runners. The Raiders led the way here, grabbing left tackle Trent Brown, who was a major contributor to New England’s title run, for $66 million over four years. Buffalo, whose 2018 season in part was destroyed by problems up front, got Chiefs center Mitch Morse for four years and $44.5 million, and tackle Ty Nsekhe ($14.5 million for two years). Recognizing how its O-line had regressed, Atlanta spent nearly $40 million for two guards, James Carpenter and Jamon Brown. Carolina, San Francisco and Seattle also dived in with huge sums for huge men on the O-line. And Baltimore re-signed what coach John Harbaugh calls “the best blocking tight end in the league,” Nick Boyle, for $18 million over three years. Early returns indicate players are getting more guaranteed money, in total and percentage-wise. A fully guaranteed contract such as the deals hundreds of baseball players negotiate, remains extremely rare in the NFL. But there’s progress being made, and perhaps Kirk Cousins’ megadeal in 2018 (three years, $84 million) eventually will be a bellwether. No question the Browns, Raiders, Jets, Bills and 49ers all took major steps in upgrading their rosters through trades and free agency. What do those five have in common, though? How about lots of losing in recent years? Certain units that needed improving, aside from the aforementioned offensive lines, got an influx of talent: Kansas City’s and Green Bay’s defense; Washington’s secondary; and Jacksonville’s quarterbacking with Nick Foles. The Steelers, long the measuring rod in the AFC North, look severely weakened — and they already did so too often in tight games last season. Giants fans might be wondering why they should show up at MetLife Stadium this year. Well, there’s the sensational Saquon Barkley. Miami, which traded starting QB Ryan Tannehill to Tennessee on Friday, is in full rebuild mode. Carolina could wind up there, too. TAMPA, Fla. (AP) — The Tampa Bay Buccaneers have hired Maral Javadifar and Lori Locust as assistant coaches, becoming the first NFL team with two female coaches on their staff. Locust and Javadifar are also the first full-time female coaches in franchise history. Locust will be an assistant defensive line coach and Javadifar an assistant strength and conditioning coach. “I know how hard it can be to get that first opportunity to coach at the highest level of professional football,” Buccaneers coach Bruce Arians said in a statement. Locust joins the Bucs after working as the defensive line coach for the Birmingham Iron of the Alliance of American Football. Last year, Locust served as a defensive coaching intern for the Baltimore Ravens during the team’s training camp. Javadifar has most recently worked as a physical therapist in Seattle. A native of Queens, Javadifar played basketball at Pace University in New York. Among the proposals teams have made to the league’s competition committee are an increase in the number of plays subject to video replay review and a change to the overtime format. The idea of more or even unlimited coaches’ challenges is not new, but could have stronger support now. Also, the league is reluctant to expand replays for officiating because it would slow games even further. The competition committee will present teams’ proposals and some of its own to the 32 owners at the league meetings March 24-27. Washington wants any play to be subject to coaches’ challenges or to automatic review by the officiating department in New York. The Redskins also suggested that all personal fouls be subject to review, while Kansas City added potential personal fouls that were not called on the field be looked at. Fans and many media members have vociferously expressed displeasure with the current system regarding coaches’ challenges since a blown call late in the NFC championship game — officials missed a blatant pass interference penalty and a helmet-first hit by the Rams’ Nickell Robey-Coleman deep in Los Angeles territory. The non-calls helped Los Angeles force overtime and eventually win the game to reach the Super Bowl. While the league is wary of expanded replays, the Eagles’ suggestion on scoring plays and turnovers negated by penalty being reviewed could garner support. Kansas City’s overtime proposals also stem from recent developments, including the Chiefs losing the AFC championship after rallying to tie New England. The Patriots won the coin toss, drove downfield and scored a touchdown without KC ever touching the ball. Denver recommended an alternative to onside kicks by allowing a team once during the fourth quarter to play offense instead. That team must notify the referee of its intention to forgo a kickoff or safety kick. The ball will be spotted on the kicking team’s 35-yard line and that team will have one down to gain 15 yards, essentially a fourth-and-15 play. If the play succeeds in gaining a first down, that team keeps possession as if it recovered an onside kick. EAST RUTHERFORD, N.J. (AP) — After a week of being beaten up in the media over the trade of popular star receiver Odell Beckham Jr., general manager Dave Gettleman went on the offensive, saying the trade was in the best interests of the New York Giants and was a deal the organization could not refuse. Gettleman didn’t stop there Monday, speaking for the first time since sending Beckham to the Cleveland Browns last week in return for first- and third-round draft picks this year and safety Jabrill Peppers. The executive also defended quarterback Eli Manning, saying the belief the 38-year-old two-time Super Bowl MVP can’t play well anymore is a “crock.” He laughed off the idea that the trade for 29-year-old guard Kevin Zeitler and the free agent signing of 34-year-old safety Antoine Bethea gave the Giants a couple of old players, saying both are good players and good people. When pushed about what is his plan for the Giants after winning three games in 2017 and five last season, Gettleman basically told reporters it was none of their business. He said the team is building, it has a master plan that would become apparent over time, and he would be judged by how it worked out over the next few years. In discussing Beckham, Gettleman said he only approached the Bills about a deal for the 26-year-old wideout — partly because he heard Buffalo might be getting receiver Antonio Brown from Pittsburgh, and the other part was his friendship with Bills general manager Brandon Beane, who worked for him in Carolina. Gettleman did not shop the three-time Pro Bowler because he felt doing that would not give him the upper hand in trade talks. He said the San Francisco 49ers called and the teams had numerous conversations without reaching a deal. Once Browns general manager John Dorsey called on Tuesday, it took 10 hours to work out the deal. It was finalized over the weekend when Beckham and Peppers passed physicals, Gettleman said. The obvious question is why get rid of the guy who has been the record-setting catalyst of the Giants’ offense since being the No. 12 pick overall in 2014 and the Offensive Rookie of the Year that season. Gettleman called Beckham a tremendous talent, but said the Giants got three assets in return, at the very least. The 68-year-old GM said he knows the Giants did not sign Beckham last summer to a $90 million deal to trade him, but things changed when the Browns made a value-packed offer that “knocked it out of the park” and allowed New York to address multiple positions on a team coming off a 5-11 record. Gettleman says the litmus tests for trading a star player is the value of what a team would get if it lost a player who had a franchise tag: two first-round picks. He says the Giants got that in Peppers plus the No. 17 overall pick and a third-rounder. He added that time will tell whether the Giants made a good deal. The recent personnel moves have put the Giants under a microscope, especially because the team has made the playoffs once (2016) since winning the Super Bowl in February 2012. After the past season, New York did not franchise-tag leading tackler Landon Collins — Gettleman said teams called at the trading deadline last year to ask about acquiring Collins, but no one offered enough; traded sacks leader Olivier Vernon to Cleveland for Zeitler; made the Beckham deal; and stuck with Manning, who got a $5 million roster bonus this week. “This narrative that Eli is overpaid and can’t play is a crock, I’m telling you,” Gettleman said, adding he doesn’t mind if people disagree with him. Gettleman said it was not his responsibility to discuss the Giants’ plan for the future. AUSTIN, Texas (AP) — Former Texas quarterback Vince Young, whose last-minute touchdown against Southern California in the 2006 Rose Bowl delivered the Longhorns’ only undisputed national championship in the last 50 years, has been fired by the school from his part-time job as a development officer for poor performance and often being absent from work or not in touch with his supervisors. The move comes after job warnings dating to 2017 and a second drunken driving arrest within three years on Feb. 4. After initially accepting responsibility for the drunken driving incident, Young has said he will fight the charge. Young was notified March 1 he’d been fired from the $50,000 job “for not demonstrating significant and sustained improvement in the performance of your job responsibilities and failing to maintain standards of conduct suitable and acceptable to the university,” the letter said. The Associated Press obtained a copy of the letter and Young’s personnel file through an open records request. Young declined to comment Saturday. A Texas spokesman said the school would not comment on a personnel matter. Firing Young is a remarkable step by Texas, which has kept several other prominent athletes and coaches close to the school as ambassadors, athletic department advisers and fundraisers long after their careers on the field ended. None has been bigger than Young, and none delivered greater success or a more iconic moment on the playing field: His scrambling touchdown on 4th-and-5 against the Trojans won a game considered among the greatest in college football history. After turning pro and signing a $25 million NFL contract, Young was out of the league by 2014 and filed for bankruptcy. Texas gave him a lifeline with a full-time, $100,000 job as a development officer in the school’s Division of Diversity and Community engagement. The job later became part-time. In September 2017, Young was given a strongly-worded “Unacceptable Performance and Conduct” reprimand and put on notice he could be terminated. He was cited for often being missing from work, skipping meetings with supervisors with no explanation and missing several weeks or months’ worth of timesheets and employee calendar updates to account for his whereabouts. The timesheets were eventually submitted by an acquaintance not affiliated with the university. Eleven days after his drunken driving arrest, Young was notified on Feb. 15 his firing was imminent unless he could demonstrate a reason not to. According to a letter from Patrick Patterson, assistant vice president for the Longhorn Center for School Partnerships within the Division of Diversity and Community Engagement, Young didn’t tell his supervisors about his arrest until after it was reported in the media and only then by text. When the men spoke the next day, Young said he intended to resign immediately but didn’t. He then requested medical leave but didn’t qualify because he hadn’t worked enough hours the previous year. “Due to both your past disciplinary history and recent events,” Young would be fired, Patterson wrote. Young would be allowed to use up to 12 weeks accrued time off to stay on until May if he provided documentation from a health care provider that he was under medical care. According to his termination letter, Young never filed that paperwork and he was fired. In a response letter to Patterson, Young said he wanted to stay on, arguing he’d developed valuable donor relationships for the school and had been a good ambassador for the outreach program. He also said he’s tried to stay sober since his first drunken driving arrest in 2016.